Introduction: Tattler Reusable Canning Lids were first introduces in 1976. Recently they have gained popularity as more people are turning back to canning as a way to save money during hard financial times or to help protect their families from harmful contaminants that can be found in mass produced canned goods. Tattler Reusable Canning Lids are indefinitely reusable. They can be used with pressure canners, water baths or vacuum sealers. These reusable lids are made with FDA and USDA approved materials, can be used with standard metal bands, are dishwasher safe, are made in the USA and are BPA free. These plastic lids come with replaceable rubber rings to help create a great seal on your home canned goods. Tattler guarantees their plastic reusable lids to last a lifetime or they will replace it free. However, since they began selling their lids no customer has EVER made the request to replace a single lid. 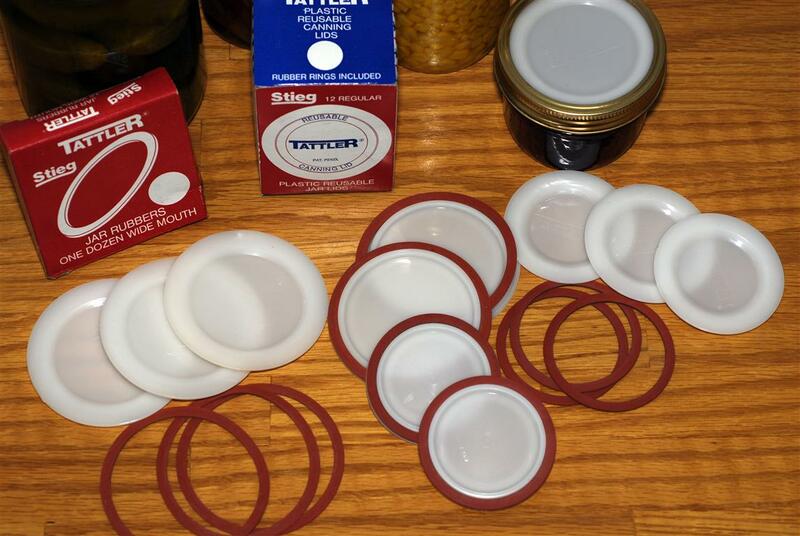 Many of Tattler's customers have used the same lids for more than 30 years. Visit their testimonials page and see for yourself. This is a photo of a satisfied Tattler user from 1980. She is Dorothy, the mother of the inventor. 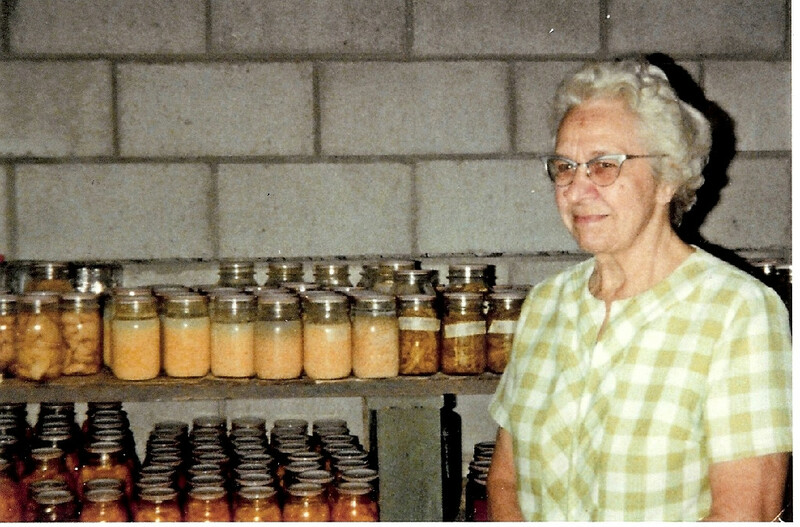 In this photo she is pictured next to her root cellar filled with the previous season's hard work. Selection: Tattler Reusable Canning Lids are available in regular size and wide mouth. You can also purchase replacement rubber rings, although the rings themselves will last for several years before needing replaced. Review: We received a dozen regular sized lids with rubber rings to review. So far we absolutely love them. The only difference between using Tattler lids and using metal lids is that when you screw the lid on before processing you have to turn back the metal band 1/4 inch to allow the Tattler lid to vent better. Then when the jars are finished processing you simply retighten the rings. I used these lids to can a batch of applesauce and didn't have any problems whatsoever. If was a little disappointing not to hear the much anticipated pop that you hear with metal lids. However, it was easy to tell that the lids have sealed by unscrewing the rings and then pulling up on the lids very gently. I can't wait to use these lids more next summer and for many, many summers after that. 1. Visit their website, then come back and tell us something else you learned about Tattler Reusable Canning Lids. The giveaway will end Monday, December 6th at 11:59pm EST. We will pick the winner through random.org. The lids won't corrode from acid. I love, love, love that they're BPA free (and acid won't corrode them!). They are dishwasher safe. I like to can things from my garden. I learned that they have an instructions and tips page which would be great for my sister, who I'd give these to if I won them! I love love love these reusable lids. I have one that a friend gave me and can't wait to get more. I learned on the site that these are bpa free and I didn't realize the traditional lids had bpa. I follow this blog through google friend. they contain no BPA - now that is COOL!! I love that they are made in the usa. I learned that they can be used in both a pressure canning unit as well as a hot water canning unit. i love that you can use it for ALL types of canning, and it's indefinitely reuseable! awesome! I learned that they are also dishwasher safe! These look so awesome! I learned they replace broken lids for free, are BPA free and are made in the USA! I love that they are bpa free I didn't realize that normal lids have bpa. I learned that the lids are so durable that the longevity of TATTLER Canning Lids presents the likelihood they will be handed down to the next generation of food preservation enthusiasts! This is awesome! I'm always trying to invest in items that not only I will use for years to come, but I will be able to pass to my daughters as well! I learned that the rubber gaskets can last up to 20 years. Wow! I just subscribed to your feed!